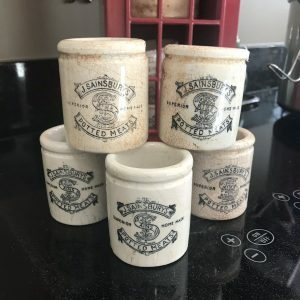 Each Pot measures approximately 2” diameter x 2 1/2″ tall . This is a listing for A group of five (5) Sainsbury Potted Meats. 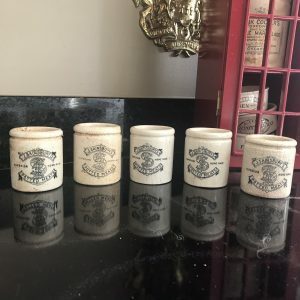 These sweet ironstone crocks dated between 1880 and 1920. I will select five pot out of my current inventory. Perfect for gift giving, planting little succulents or pouring your own candles into. Please let me know in the comments if you prefer with a large or small amount of crazing and age marks and I will do my best to meet your request. Beautiful graphics on this little pot, a perfect start or great addition to your Antique English Advertising Pot collection. 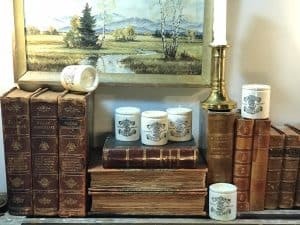 The other items in photos are for display only, ideas for displaying in your home.